As the leaves begin to change here in Southeastern Pennsylvania, my love for this time of the year starts anew. Our home is once again decorated with the warm colors of fall, and seasoned with a bit of Halloween mischief. During the day, my wife's season decor appears vibrant in color and almost warm to the touch. A walk into our home could easily lead one to assume that a pumpkin pie must surely be baking from somewhere in the kitchen. At night, the little faces of wood carved ghosts and the smiles of friendly pumpkins are accented by the orange glow of a nearby light, and I can't help but smile myself as I take it all in. I, too, have my fair share of Halloween displays - most of course brought to life by the many characters that make up my growing Disney collection. Halloween has always brought fond memories for me, thanks largely to the many spooky stories and films introduced to me as a child by my parents. I'll never forget the night when my mother and I watched Disney's "Halloween Hall O' Fame" hosted by the fanatical, Jonathan Winters. As I recall, Winters was cast as a Disney Studio security guard, working the graveyard shift within a building on the studio lot. He comes across many interesting treasures, one mainly being a talking pumpkin that introduces the classic 1949 Disney short film, The Legend of Sleepy Hollow. My introduction to this cartoon not only entranced me as a child, but it has become an annual staple of the Randle household this time of the year. In fact, I never pass up the chance to share this classic cartoon with each of my third grade classes - hoping that they, too, will keep the story alive someday. My exploration of Disney history has taken on many forms, one of them coincidentally being the collection of information and memorabilia linked to the Sleepy Hollow segment of Disney's 1949 classic, The Adventures of Ichabod and Mr. Toad. 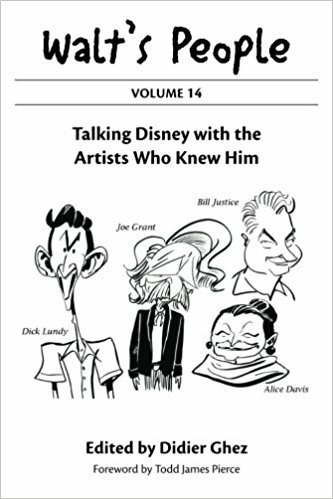 Sadly, very little has been written about this Disney cartoon, but once in a while, a book will share some of its wonderful preliminary work painted by the prolific, Mary Blair. Her contributions to Sleepy Hollow are present throughout the entire film. Blair's inspirational paintings not only capture the sleepiness of the town, but the terror that awaits the arrival of a melancholy school master deep within the woods. 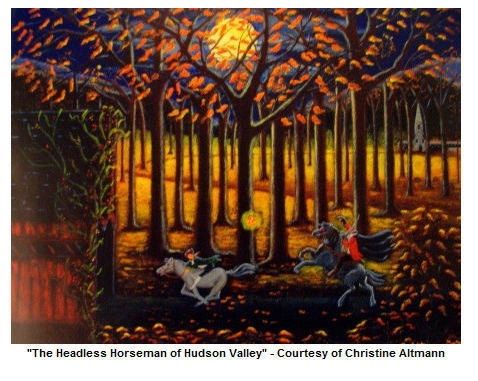 In fact, Sleepy Hollow is one of the few Disney films to utilize Blair's unique style in its background paintings. Despite the criticisms of some, I feel Blair's background style definitely compliments the animated characters of Sleepy Hollow, and adds a sort of uniqueness and richness that couldn't be achieved in the hands of others. I applaud her artistic interpretation of this classic tale - it's one of the main reasons why I view the cartoon annually today. Just when I thought that the Disney version was the only great rendition of Irving's haunted tale, I made another discovery. At this time of the season three years ago, my wife and I were spending the day in Jim Thorpe, Pennsylvania - admiring its quiet, village-like atmosphere and perusing the many shops that line its back streets. It was in one of those hidden, little shops where I made my discovery - her name, was Christine Altmann. There before me was a beautifully painted picture by Altmann, depicting Ichabod Crane's flight from the Headless Horseman of Sleepy Hollow. It captured not only the true terror and intensity of the moment, but the eerie beauty of the forest that surrounded it. 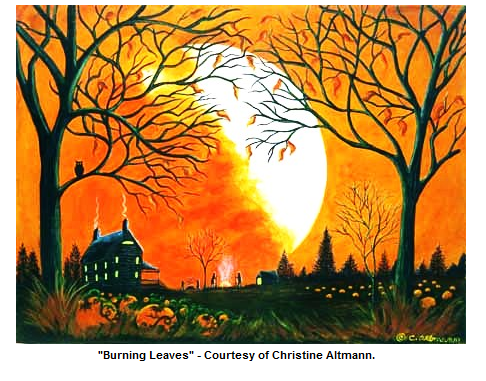 From the glowing full moon upon a midnight sky, to the orange leaves that bear witness to Ichabod's escape - everything about this painting lured me in a piece at a time. It's artistic style in fact reminded of Mary Blair's preliminary work at first glance, yet the approach of each artist is very different. Nevertheless, I knew this piece had to be mine, and since then it has become my most prized piece for this time of the year. This would not be the last time, however, that Altmann's work would cross my path. 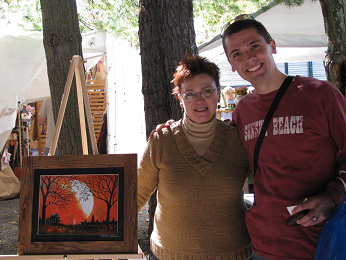 Nearly two weeks ago, my wife and I took a day off to once again enjoy the annual fall craft show held at the Knoebel's park area in north-central Pennsylvania. Among all of the craft vendors and booths that were there, my eye happened to catch one in particular - one that sent back the wave of a very fond memory. The work was undeniably hers, and at the sight of seeing her name signed in the lower-left corner, I knew I had to take another piece home. To my great surprise, I soon discovered that the local artist was there, sharing her work with all who attended. It was a pleasure speaking with Christine about Sleepy Hollow and our mutual fondness for this time of the year (and black cats). Her love for painting and Halloween is genuine, and brings so much more meaning to her work. Not only did I buy another piece of hers, but she graciously allowed me to take a picture with her to add to memories that her work has brought me. It has been a delight experiencing this connection come full circle. I am for the most part self-taught. After many years working in the retail industry, I decided I needed to pursue my lifelong dream of becoming an artist. In 2006, my first client was my oldest daughter who asked me to paint coordinating wooden dresser knobs to match my little granddaughter's bedding. I have not stopped painting since. It is a joy to wake up each morning and know I will spend the day doing what I love. It was a natural choice for me to paint Halloween and autumnal themed art. Even as a child the fall season was my favorite time of the year and next to Christmas Halloween was my favorite day. I draw inspiration from the beauty of autumn, favorite stories, imagination and of course a love of Halloween. With Christine's imagination and skill with a brush, it makes me wonder how her art could inspire the field of animation? To look at her work is to watch a story unfold right before your eyes. Christine is living proof that a picture is truly worth a thousand words.